Welcome to our latest ‘work in progress’ page, and thank-you for visiting! We are currently (October-November 2017) working to set up a number of secure channels and payment options, including PayPal, select credit cards, and information for direct EFT deposits. The (static, for the moment) options below are an indicative guide to how we are framing this new page, and we hope to have these activated in the near future: please ensure you refresh your browser when you next vist. 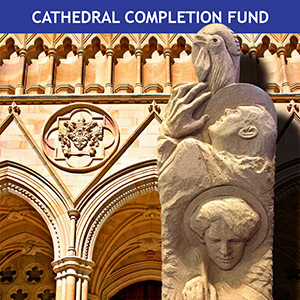 Donations to the National Trust St John’s Cathedral Completion Fund are earmarked for work on, and maintenance of, the structural fabric of this magnificent piece of Queensland’s civic and spiritual history, and contributions of $2 or more can receive a tax-deductible receipt for the donor. Options to make a general contribution or direct your generous gift to a preferred program or work component may be available via drop-down menu choices as we finalise work on these modules. Many are the messages heard by our audience and visitors to this magnificent place, although rarely at the same time. Our sound system is renowned, but for all the wrong reasons. Years of additions, rewirings and extensions have left us with a set-up of disparate speakers and broadcast qualities such that mime or semaphore seems almost a better way to communicate! In 2017, we have created and costed a sound solution, one which integrates all spaces of this wonderful building with a cohesive installation of new equipment throughout. 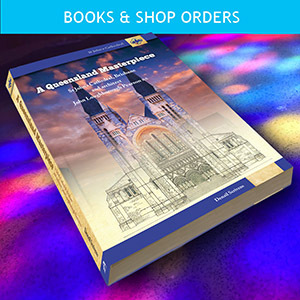 If you have made a separate enquiry for, say, the cost of postage of several copies of our wonderful book “A Queensland Masterpiece” to somewhere in the world, the intention is that here will be the module via which you can securely make your order payment (purchase and postage by reference to the order details provided). Online availability and ordering of products in our Cathedral Shop remains an aspirational goal, and one towards which we will be working during 2018. 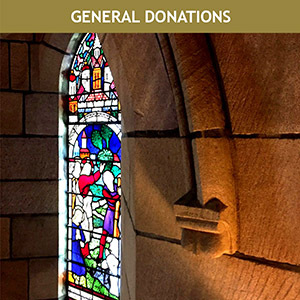 Via this module, we hope to be able to accept your kind gifts for more general purposes, whether an offering in special memory of a loved one or a cause close to your heart, or perhaps a contribution towards a cause close to ours: such as the Holy Trinity Pantry in Fortitude Valley, for example. Details of the beneficiaries of our regular Outreach programs may be found on the HOME page of this website as well as in our CCN (Cathedral Community News) monthly newsletter – please see the COMMUNITY page of this website.